In I Mace. ix. 2, Arbela is the district in which Mesaloth was situated, and through which ran the road to Gilgal (for which Josephus, "Ant." xii. 11, § 1, gives Galilee). It is probably to be identified with the modern "Irbid." Smith, Historical Geography of the Holy Land, p. 427. 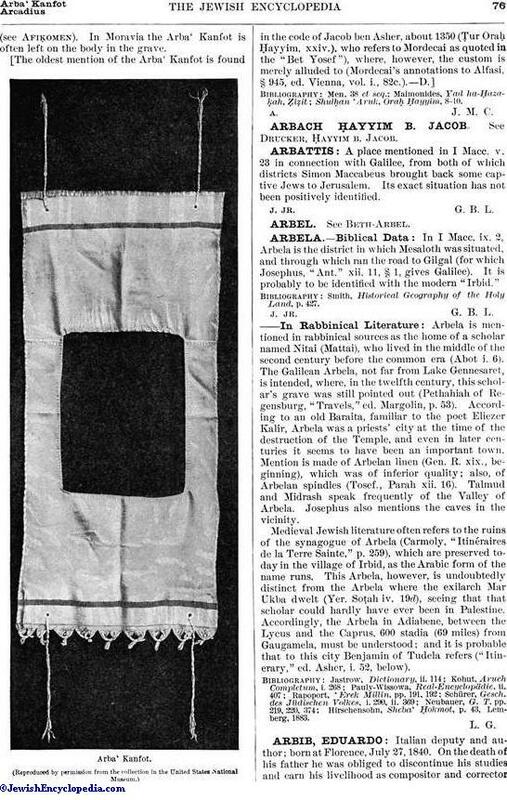 Arbela is mentioned in rabbinical sources as the home of a scholar named Nitai (Mattai), who lived in the middle of the second century before the common era (Abot i. 6). The Galilean Arbela, not far from Lake Gennesaret, is intended, where, in the twelfth century, this scholar's grave was still pointed out (Pethahiah of Regensburg, "Travels," ed. Margolin, p. 53). According to an old Baraita, familiar to the poet Eliezer Kalir, Arbela was a priests' city at the time of the destruction of the Temple, and even in later centuries it seems to have been an important town. Mention is made of Arbelan linen (Gen. R. xix., beginning), which was of inferior quality; also, of Arbelan spindles (Tosef., Parah xii. 16). Talmud and Midrash speak frequently of the Valley of Arbela. Josephus also mentions the caves in the vicinity. Medieval Jewish literature often refers to the ruins of the synagogue of Arbela (Carmoly, "Itinéraires de la Terre Sainte," p. 259), which are preserved today in the village of Irbid, as the Arabic form of the name runs. This Arbela, however, is undoubtedly distinct from the Arbela where the exilarch Mar Ukba dwelt (Yer. Soṭah iv. 19d), seeing that that scholar could hardly have ever been in Palestine. Accordingly, the Arbela in Adiabene, between the Lycus and the Caprus, 600 stadia (69 miles) from Gaugamela, must be understood; and it is probable that to this city Benjamin of Tudela refers ("Itinerary, " ed. Asher, i. 52, below). Hirschensohn, Sheba' Ḥokmot, p. 43, Lemberg, 1883.